It’s easy to get caught up in wedding dress shopping. For many brides, all else is on hold until the stunning bridal gown of their dreams has been secured. And that’s really how it should be. There’s no great way to plan hair, shoes, jewelry, undergarments and accessories ahead of the dress. Your bridal accessories are typically one of the last items to consider. More brides are opting for less bling and taking a more natural approach. Others prefer to let their inner princess shine. Decide on the items that will complete the silhouette and overall style you are aiming for. Headpieces and veils are special wedding day items that very easy to preserve. You may decide to keep them to pass down to your own children one day, making them a worthy investment. Some dresses do not work with a long flowing veil and some brides don’t either! If meters of extra fabric swirling around your shoulders, waist or ankles isn’t what you envision; no worries. Shorter lace veils such as the two distinctly different styles from Bel Aire Bridal showcase a nostalgic yet sultry option. Consider how easy it would be to incorporate the above blooming anemones into a special keepsake. Perhaps you don’t want to pack your gorgeous accessories up for years to pass on and would prefer enjoying them everyday. Many head pieces look great attached to candle holders or glued onto wreaths or mirrors. The possibility of extending the lifetime of your accessories is priceless. The luxurious rhinestone clip on this head piece has tremendous potential to be passed down for generations. Perhaps you start a family tradition and wear it on your wedding anniversary or fashion it into a clip to cherish on a daily basis. The following bridal veil tips from Laura Jayne offer some excellent advice. Having some preferences is great; however, be willing to stay open-minded and try on styles of veils and headpieces that you never considered to assess all possibilities. 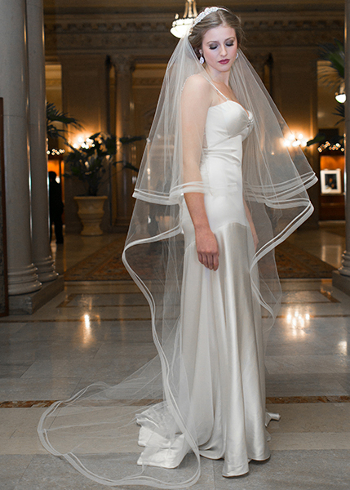 A Bride’s wedding veil will add that final romantic and mysterious touch. As unique as every Bride is, is as unique as the veil should be. Our design team creates shapes and lengths that are often as “remembered” as the gown itself.